CALICORNUCOPIA 2 Group Show Opening this Friday! On view Fridays & Saturdays, 12-5pm & by appointment. 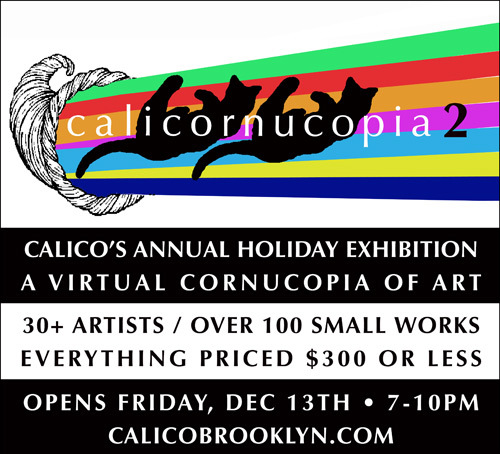 Calico invites you to join us for the second annual “Calicornucopia” exhibit. Approximately a hundred pieces to choose from will be shown by artists from Brooklyn and beyond. This salon-style exhibit features a wide variety of small works priced $300 or less - everything ready to wrap - a virtual cornucopia of art.